You can use the free Estimate Risk & Return Template to calculate the risk and return for any business venture that you can think up. This template gives you accurate calculations so you can use that information to make informed decisions about your business ventures. This template is simple and straightforward, so you can quickly enter the necessary data that the template requires and get back to what really matters. Using the free document, you will receive a return on stock and a return of the market. If you’re ready to get a template that gives you great information based on your business, then read the guide below to get started. In order to download this free template file to your computer, you will need to follow the link at the bottom of this page. The next step will be to enter the current risk rate, the number of periods you want for your data, the risk for premium stock, and the risk rate during the designated period, the current stock price, and the current annual DPS. All the above information will be entered in the first section of the template. Next, scroll down to the main table of the document to get your feedback on the information you entered above. This will include the both the stock return value and the market return value on your investments. These values can be observed in columns G and H.
Using this information, you can start to make better decisions about your business investments and plan ahead for the future of your company. 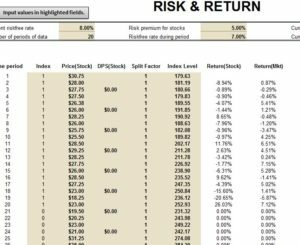 If you’re ready to get started with the free Risk & Return Template today, just click the link below.